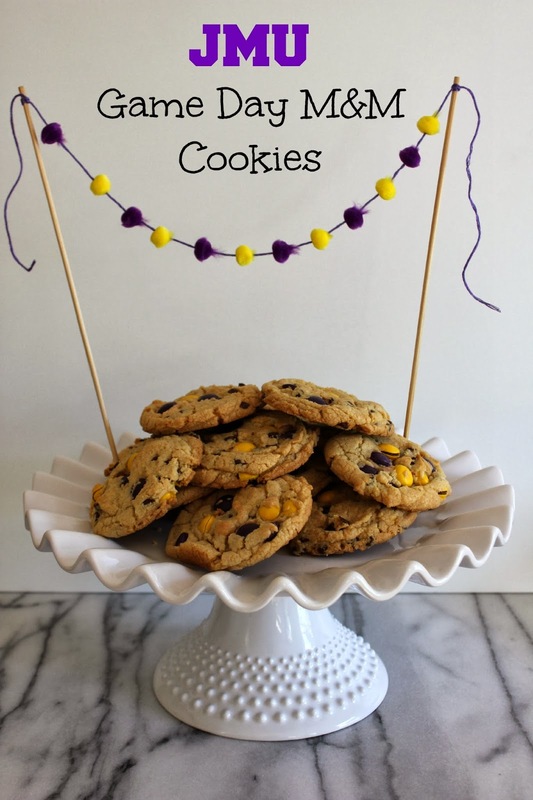 Everyone loves M&M cookies, so why not make them even more festive by featuring your team's colors. My local grocery store, Martin's, carries many different colors of M&M's in their bulk candy section, making it easy to choose just the colors you are looking for. 1 stick butter, softened to room temp. Line a cookie sheet with a silpat or parchment paper. In a medium bowl, whisk together flour, pudding, baking soda and salt. In the bowl of your mixer, cream butter and sugars. Add egg and vanilla. Slowly add dry ingredients to the wet and mix just until combined. Stir in chocolate chips and M&M candies. Using a cookie scoop, drop cookies onto baking sheet, leaving room for them to spread. Bake for 10-12 minutes. Place cookie sheet on a wire rack and let cookies cool there for 5-10 minutes before transferring them to another cooling rack. You can find more of my JMU sweet treats here, here and here. Don't forget to enter my Hamilton Beach Smoothie Blender Giveaway! Love your blog and this recipe will be fun for our next tailgate - however being a Blue Hens fan will do in Blue & Gold M&M's!! !